On this day, exactly seventy years ago, a group of revolutionaries meeting in the Bosnian town of Jajce proclaimed themselves the only legitimate government of Yugoslavia. By itself, their declaration meant little. Yugoslavia hardly existed in practice, partitioned between the German Reich and its Hungarian, Bulgarian and Croat allies. The royal government, which in April 1941 left the country to continue the fight from exile (as did the governments of Czechoslovakia, Poland, France, and Greece, among others) had appointed General Mihailovich, a staff officer leading the guerrilla movement, their Minister of War and commanding officer of the Yugoslav Army in the Homeland. In addition to fighting the Germans, Croats, Hungarians, Bulgarians, Albanians and even some collaborators among the Serbs, Mihailovich's guerrilla also fought the Communist partisans, who emerged following the Nazi invasion of the USSR and made their priority to claim Yugoslavia for the socialist workers' revolution. By late 1943, after Stalingrad and Kursk, it was clear that Germany would lose the war. That the Soviet tanks would show up was a question not of whether, but of when. Meanwhile, the Western Allies landed in Italy, forcing its surrender in September 1943. That had multiple consequences for the war in Yugoslavia. Until then, the Italians were able to suppress the genocidal rampages of Croats and Albanians. Afterwards, they had a free hand and full German support, in exchange for Waffen-SS divisions made up of Albanians and Bosnian Muslims (Skenderbeg, Handschar, Kama). The Communists did nothing to stop the atrocities. In line with their dogma, the Serbs were "oppressors", while the Croats and Albanians were the "oppressed" - so even though the Albanian leadership and the Ustasha were "reactionaries" and "fascists" in the Communist book, the mass murder and expulsion of Serbs were not objectionable as such. To be fair, Communists weren't the only ones at the meeting in Jajce. 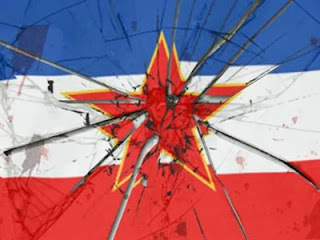 Some of the "delegates" were pre-war politicians from opposition ranks: Croat separatists, Bosnian Muslims, and others generally sympathetic to the Communist platform of resurrecting Yugoslavia, but as a federation. If the Communists were the radicals, these "democrats" were their useful idiots. Meanwhile, the Serbs in Communist ranks have by then so internalized the dogma of their own collective guilt for alleged "bourgeois imperialism", become so fanatical in their faith - and make no mistake, Marxism was a religion, though its deity was of this world - that they not only agreed to stand by while their families were being slaughtered, but to shift blame for the atrocities onto the designated "fascists," while the collectives that participated were actually rewarded. Thus arose the post-war Socialist Republic of Croatia, laying claim to Istria, all the Adriatic coast, Dubrovnik and western Syrmia, for example. Thus came about the "Autonomous province of Kosovo". Why did the Communists believe that November 1943 was the right time to declare themselves the new rulers of a country they had yet to resurrect from under the Nazi heel? The Red Army was coming, but it would take them another nine months. Could the answer lie in the West? In 1915, the Serbian Army and government retreated before the German, Austrian and Bulgarian invasion; the survivors reached Entente territory in Greece, and were deployed at the Salonica Front. In September 1918, the Serbs spearheaded the Entente attack and rolled up the front; six weeks later, they had not only liberated their homeland, but were approaching Vienna. The royal Yugoslav government hoped for a repeat performance, with an Allied landing along the Adriatic coast helping Mihailovic launch a general uprising. But the plans for an Adriatic Landing never went beyond the theoretical. A day before the meeting in Jajce, Stalin met with Churchill in Tehran, and demanded the British switch their support from Mihailovich to Tito's Communists. Churchill wasted no time in agreeing. Supposedly, this is because Tito's men were "killing more Germans" - which was simply not true. But the fact that Stalin's demand and the meeting in Jajce were almost simultaneous suggests it was coordinated on the Communist part. As for Britain's betrayal, it is a fact of history - only the motivations remain beyond conclusive explanation just yet. There are several theories to explain it, from secret Communist sympathizers in British intelligence (who did exist), to a story that young Churchill was roughed up by some Serbian officers for libeling the Serbs while he covered the Balkan Wars as a journalist. But the best explanation is probably the simplest: to London, the Serbs have ever been but an extension of the hated Russians, so Whitehall preferred a Croat-led Yugoslavia that would keep the Serbs under control. Interestingly enough, Hitler thought the same. Another clue can be found in the decision of Jajce revolutionaries (calling themselves the "Anti-Fascist Council of People's Liberation of Yugoslavia, or AVNOJ) to ban the royal government from returning to the country. In sections 3 and 4, the AVNOJ leadership is tasked to "review all the international treaties and obligations" the royal government entered into, "for the purpose of nullification or approval", and declared all subsequent treaties made by the royals null and void. This enabled both London and Washington to effectively confiscate the gold reserves the royals managed to take with them, as "payment" for all the military aid provided to both Mihailovich and the Communists. The remaining gold, hidden in Montenegrin caves, was discovered in 1943 by an enterprising Italian officer - who sent a small portion to Mussolini, gave the half of the remainder to Tito in 1944, and kept the rest for himself. Meanwhile, the Communists kept telling the people the "corrupt plutocrats" of the royal government stole all their gold. And while King Peter II died broke, Tito lived and died like a pharaoh. The suppression of Croat atrocities not only made Tito's Yugoslavia possible, it was also extremely useful for keeping the Church of Rome useful during the Cold War, as a tool of anti-Communism in places like Poland. And so, on that November night in Jajce, a plan approved in Tehran was set in motion. Hitler had already unwittingly provided a template. Eighteen months later, when Soviet tanks drove the Germans out, Tito became the pharaoh of a reanimated Yugoslavia. Though the principal victims of Nazi invaders, and principal fighters against them, Serbs loyal to the king were persecuted, and even those who backed Tito found themselves third-rate subjects in their own country. Adding insult to injury, they were told this nightmare was the ultimate fulfillment of their historical dream of freedom. 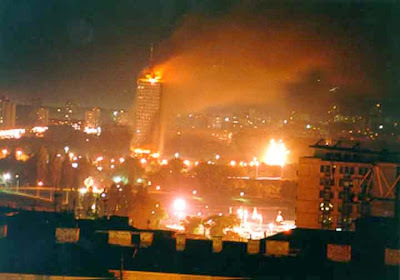 Though both Tito and Yugoslavia are long gone, the nightmare endures. Seventy years later, it is high time for the sleeper to awaken. Yesterday, after Croatia's victory over Iceland qualified them for the 2014 Soccer World Cup, one player led the home crowd in a victorious chant. AP (via HuffPost) has a video of it, noting that it caused a bit of furor on account of being, well, Nazi. AP quotes "Joe" Simunic - born in Australia, to Croatian emigre parents - saying, "I did nothing wrong. 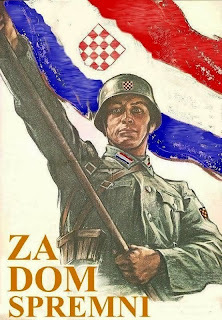 I'm supporting my Croatia, my homeland," and "some people have to learn some history." Let's learn some history, then. Ustasha (усташа, pl. усташе) - is an old Serbian word for "insurgent", appropriated (like everything else) by Croats. Specifically, a violent chauvinist movement sponsored by Fascist Italy after WW1, seeking to establish an independent Croatian state. They were given the opportunity in 1941, when Axis powers invaded the Kingdom of Yugoslavia. An "Independent State of Croatia" was proclaimed on April 10. Mass murder of Serbs, Jews and Roma (in that order) began within days. Ustasha Croatia opened an extermination camp in Jasenovac (with adjacent camps for women and children - the only such facility in Nazi Europe) almost a year before Germany's Nazi leadership decided to seek the "final solution to the Jewish problem" through mass murder. Their atrocities were so visceral, even the SS were appalled. But Hitler and the Roman Catholic Church had their back, so the genocide continued. Ironically, it was the Italians who managed to rein in the Ustasha and provide some sanctuary to Serbs and Jews in their occupation zone - at least until Italy's surrender to the Allies in September 1943. From then onward, to the end of the war, Croats and Germans were able to murder with impunity. The Communist Partisans, who later claimed to have liberated Yugoslavia single-handedly, did absolutely nothing to stop the slaughter. Oh no - after the war they resurrected Croatia as a "republic" within the Yugoslav "federation" reanimated from the kingdom's corpse, and rewarded it with territories ethnically cleansed of Italians, Germans and Hungarians. All in the name of "social justice", of course, because everything before and during WW2 had really been the fault of the "Greater Serbian bourgeois imperialism." No joke. When a Holocaust-denying Ustasha fan became the first "democratic" president of that Croatia in 1990, his revival of Ustasha language, symbols and values was cheered in the West as "anti-Communist" (and again, got the Roman Catholic Church's blessing). Thousands of Ustasha Croats returned from exile in the U.S., Canada, Australia (Simunic, for example). Meanwhile, Serbs living in Croatia were first disenfranchised, then subjected to state abuse, property destruction and outright murder. But when they took up arms in self-defense, that was dubbed "aggression." So obviously, in this twisted world, the Ustasha Croatians are "good guys" and their victims - the Serbs - are evil incarnate. And "Joe" Simunic is just a misunderstood patriot. Sure, technically his words were innocent. All he said was, "For the home," and the crowd howled back, "Ready!" And it's not like they haven't done so before. So, should we mind if, say, Germans give a salute to victory? The first post on this blog (then called "Black Lamb & Gray Falcon") appeared on November 18, 2004. Has it really been that long? Time flies, when you're having fun. I've blogged at Antiwar.com prior to that, and have been writing for a lot longer - since 1999, to be precise - but always as a guest. Falcon was the first Web location truly my own. By my count, there have been 520 posts here prior to this one. Back in 2004, I could give my full attention to columns (then still called "Balkan Express", now "Moments of Transition"). Things that didn't fit there, found a home here. Then in March 2005, I launched Falcon's Serbian sibling, which has flown higher and farther yet. Designs, templates, links and fonts have changed, but the substance has remained consistent. More than the posting schedule, anyway. I won't apologize for it, though: throughout, my guiding notion has been that an essay has to be done right, or not at all. Even if quantity has a quality all its own. It has been an amazing journey. The blog has made a difference right from the start and continues to attract both fans and haters, legitimate comments as well as trolls. And that's the thing: before the internet, the legacy media were the only game in town. Today, everyone has a soapbox. Sure, this includes the trolls, the sock-puppets and the mainstream propaganda machine - but at least they are now on equal footing with the rest of us. I'll take that over the old order, any day. In the coming days, I may clean up some tags, sort the links, and tweak the template a bit. Those are all details, though. What matters most are the articles. And they will keep coming, because that's always been Falcon's mission. On November 3, local elections, called under the so-called laws of the so-called "Republic of Kosovo", were held in this occupied Serbian province. In the four counties in the north, inhabited and defended by Serbs who refuse to submit to the NATO-backed Albanian regime, the vote failed: less than 4% of people showed up, in spite of overwhelming propaganda from the treacherous Belgrade government. The Empire's solution was appropriately Orwellian: they will vote again (and again), till they get it "right" - i.e. submit to "Kosovian" authorities. As the repeat vote - scheduled for November 17 - looms, I've taken the liberty of translating some thoughts by Aleksandar Pavic, published Wednesday by the Strategic Culture Foundation. As Imperial and quisling media dominate English-language coverage coming out of Serbia, I think this would be a valuable reminder to Balkans-watchers of what reality looks like. "This country is too small for traitors such as us"
We await - and may wait indefinitely - for someone from the most progressive circles of the most progressive Euro-Atlantic civilization to condemn the outright racist threats directed at the Serbs in North Mitrovica recently by the most progressive Euro-Atlanticists in Belgrade. As the repeat "elections" loom at three precincts in that city, the message from Belgrade is: vote, or get an Albanian mayor! Where is the European Union? Where is the European Commission? OSCE? UNHCR? EULEX? Independent observers? The Commissioner for Protection of Equality? Where are the Liberal Democrats, the Other Serbia, the Center for Cultural Decontamination? Where is Boris Tadic, the new global defender of multiculturalism? Where the hell is the American Ambassador? Does their silence mean approval of this racist message from the government of Serbia, namely PM Dacic and Commissioner Vulin? If they truly want a "multiethnic Kosovo" as they say, why would the possibility of an Albanian mayor in a Serb community be objectionable? By the way, you won't hear such shameful, extremist intimidation from those advocating the boycott. The only thing that truly appalls them is the thought that anyone in Kosovo and Metohia - but especially in the North - could get elected on the basis of "Kosovian" laws. Because, unlike their "progressive" EUropean fellows, they truly believe in the rule of law, and are prepared to fight for it. I am willing to wager that the boycott crowd has nothing against an ethnic Albanian being elected mayor of North Mitrovica - so long as the election is conducted under Serbian law. Of course, in that case the Serbs of the North would turn out in great numbers. Still, in principle they have nothing against the notion of a loyal Albanian holding the office of mayor. Such a person would bother them far less than one of Thaci's "Serbs." Generally, boycott advocates - who oppose Kosovo's separation from Serbia - have shown a far greater commitment to multiethnic coexistence than their "urbane" opponents. Note that those who preach "letting go of the Kosovo ballast" most often imply that the "amputation" of Kosovo is necessary in order to avoid being "swamped by two million Albanians" allegedly living in the province (In truth, there are far fewer - but that's a topic for another day). On the other hand, the alleged "nationalists" have zero objections to living alongside Albanians - on one condition: that this be within the framework of Serbia, the most ethnically diverse country in this region of Europe, rather than in a quasi-state led by former and current drug-runners and merchants of human flesh. So, who are the real extremists, and the truly intolerant? Those who exchange handshakes with faces on wanted posters, or those who refuse to be governed by them? Isn't all this a bit upside-down? The newest government line that the Serbs of the North "would be solely responsible" if an Albanian is set over them is a monstrous projection. Rather, the responsibility would rest squarely on the present government of Serbia. Because it accepted an "election" held under the so-called "Kosovian" laws. Because it refuses to call an election under its own laws. Because it signed an agreement in Brussels that recognizes "Kosovian" writ in the entire territory of the occupied province. Is a government anywhere else in the world voluntarily giving up a number of its citizens, and forcing those citizens with everything at its disposal - including the threat of military intervention - into the hands of the enemy? And then trying to wash its hands, like Pilate, of the whole thing and blaming those who just want to stay in their own country, and have the same rights as everyone else? By the same token, is there a media more shameless than the media in Serbia? Is there a press anywhere that absolutely refuses the opportunity to speak to any defender of the Constitution and the laws of the land? Where else is there a pack of journalists so willing to ignore the elephant named "Constitution" in the room, eager to whitewash the government of any blame, and organize witch-hunts against anyone daring to defend the legal order? At the top of the dung heap is the daily Kurir, engaging in systematic demonization of Dr. Marko Jaksic. Their libels seem calculated to strip him of all humanity, turning him into the modern Goldstein, fair game in the Wild West called "Kosovo." Just the other day (November 12, 2013, page 2-3), Kurir accused Jaksic - the same man who speaks out daily of the need to comply with the Constitution, the laws and the UNSCR 1244 - of "undermining the system"! This is accompanied by repeated accusations that Jaksic has "met with Thaci", that he owns valuable real estate in the country and abroad, and that his arrest is impending. All this is calculated to create a climate in which any violence against dr. Jaksic would be spun as acceptable to the general populace. Only 3,8% of the Serbs in the North actually turned out at the "Kosovian" polls on November 3. So, if Thaci's followers - Serb or Albanian, it really doesn't matter - take over, or some misfortune befalls dr. Jaksic, the blame will not rest on the boycott advocates, or anyone else in the North, but rather squarely on the shoulders of the government in Serbia. The very men who once swore to defend Kosovo and Metohija are now trying to surrender and force their compatriots under the yoke of the Albanian mafia. The very people mounting a smear campaign against the man who made it possible to negotiate about North Mitrovica in the first place. Last, but not least, it is worth mentioning the newest edition of "Odnako" (However), hosted by Russia's best-known and most popular political journalist, Mikhail Leontyev. Shown on November 12 on Channel 1 of the Russian public TV, it looked critically upon the so-called local elections in Kosovo, and the role of the Serbian government in them. Those in the government with eyes to see and ears to hear ought to at least try and see the messages coming from Moscow these days. Yes, there were pompous proclamations of mutual appreciation surrounding the (unnecessarily complicated) start of construction on South Stream. 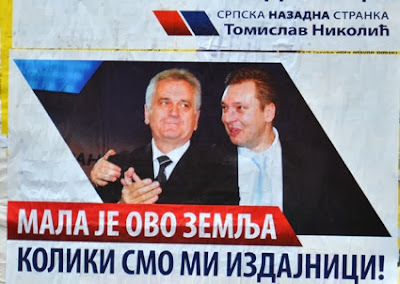 However, there was also an interview with Marko Jaksic, with a clearly shown poster in the background of the two Progressive leaders and the caption: "This country is too small for traitors of our caliber". There were also images of the defaced government posters calling for participation in the "elections", as well as the "clean up the trash day" in North Mitrovica, where the people took down government propaganda material. Analysts agreed that by backing the separatist polls, Belgrade "recognized that Kosovo is not Serbia". Slavko Stevanovic was interviewed and introduced, without any hesitation, as the "Chairman of the recently constituted Assembly of the Autonomous Province of Kosovo-Metohija." "...it is too early to feel sympathy for Nikolic. However, God only knows how this will end. This is Serbia, after all, where his predecessor Djindjic was simply taken aside and shot. Well, goodbye!" They were seen as a shining example of Bosnia's rebirth from war: a fleet of high-speed trains built-to-order in the West. Eight years later, they haven't made a single ride. The reason: They're just too fast for Bosnia's 60-year-old rails. "It's as if you bought nine Ferraris and ... no roads to drive them on," said Samir Kadric, an official with the publicly-owned railway company that bought the trains. Predictably, AP's Aida Cerkez prefers to insinuate the problem lies with Bosnia's division between the Serb ("dominated") Republic and the Muslim-Croat ("shared") Federation. And the article blames the "Bosnian-Croat railway company" (presumably Željeznice Herceg-Bosne, ŽHB) for the $90 million train flop. Here's the thing, though: the train deal was supposedly made in 2005 (see "eight years later" above), but if Wikipedia is to be believed, ŽHB had merged with the Muslim-run BHŽ into the ŽFBH (i.e. Federation Railways) in 2001 - four years prior to the boondoggle. I, for one, don't believe for a second that this was a product of simple stupidity. Remember, "Bosnia’s politicians have taken rent-seeking to the level of a dark art, systematically siphoning profits from public utilities and corporations to line party and personal pockets." (from Reality Bites Back) Someone made out like a bandit on this "deal", and - judging by the know-nothing attitude of people interviewed by AP - with impunity. Perhaps the fact that the railroad execs intend to recoup the money by leasing the trains to Turkey might give us a clue as to who.